Pat Bolling is a lot like his chicken pot pie offered at Rhino Coffee. On the inside, he is warm and comforting. On the outside, he is fresh yet familiar. It’s no wonder Bolling’s favorite menu item stems from his own qualities. As the chef at Rhino, located at 721 Southfield, Bolling makes customers feel right at home. Some days he will pop out of the kitchen with a sample asking for thoughts from customers. After a taste, you start to feel like part of the family. Though he has never been formally trained as a chef, Bolling studied both of his grandmother’s made-from-scratch techniques. Working at various restaurants and catering events, helped him perfect his cooking. Though he wouldn’t directly call himself a foodie, Bolling said he tries to stay keen on cooking trends and gets new ideas from almost everywhere. Within the first year of Rhino opening, Bolling stepped on board to build on the menu that Rhino owner Andrew Crawford first developed. Now in their second year, Bolling said he appreciates the diversity of Rhino customers mentioning the unique age range of the locals they serve. From the old-school chicken pot pie and beef stew to the egg white California wrap and gluten-free scones, it’s a given that Bolling caters to his customers. Martin, a trained pastry chef. Her sweets range from blueberry lemon tartlets to gluten-free scones. In the tartlet, blueberry and lemon curd sing in a sweet summer harmony taking the tastebuds on a vacation. When the chicken is finished it can go on to the smoked chicken salad or the chicken pot pie. The salad features the smoked meat with plenty of fresh mixed greens and vegetables and holds a side basil vinaigrette. The dressing blends nicely with the freshness of the salad. The chicken pot pie is a dish reserved for the pull apart melt-in-your-mouth pieces that are coated in the goodness baked in a single serve dish. But there’s a unique draw to the dish if a heavy hitting lunch isn’t what is desired. In Bollings words, “Instead of putting a big clunky biscuit on top,” he went for crispy light (almost crouton-like) mini biscuits to seal in the oven baked goods on the inside. 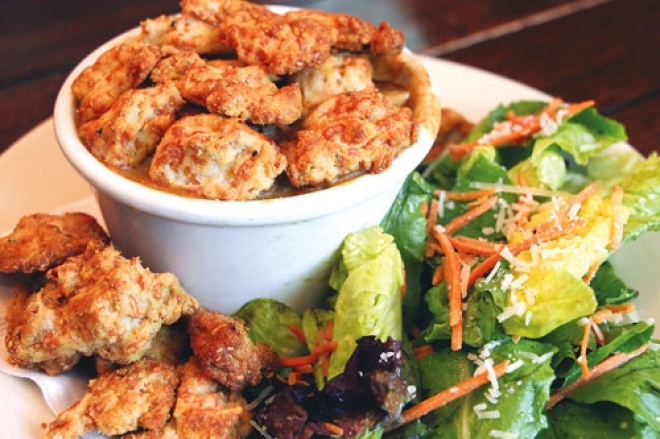 The spinach artichoke dip is another treat, but don’t think this appetizer is just for one. A small group could share one serving of this masterpiece. Bolling coats the bread served along the appetizer with the same olive oil used to roast the garlic in. Adding that secret of roasted garlic to the dish backs up the flavor of the oven-roasted ingredients. Most of Bolling’s menu items are on the lunch and dinner menu, however, breaking out a breakfast wrap is one of his nods to the health conscious. The California wrap for breakfast is egg whites mixed with tomato, feta cheese and is perfect with the basil vinaigrette. Bolling said the food is all about making dishes customers want.